Ask anyone that knows me, and they will nod their heads and say, “Yes, Ally really loves Arizona.” It is one of the best states in the union, and I am fairly confident this is fact, not opinion. Towering peaks! Wild sunsets! Blooming cactuses! Snowy mountains! Massive canyons! Moderate winter temps! Arizona has it all! Where do I submit my job application for the AZ Office of Tourism? “California has all that AND the ocean!” my friends like to argue to which I say merp-de-merp to YOU and one day when California breaks off into the sea that 80s George Strait song will be true and there will, in fact, be oceanfront property in Arizona. Notwithstanding California’s eventual dramatic breakup with the continental U.S., the Arizona deserts have their own ocean—these skies stretching blue from horizon to horizon—“skies that pull you into infinity” as author Anne Lamott describes it. Look, I know Arizona could most certainly win a 30-yard dash against the fires of hell when it comes to the raging heat of the summer months. Accordingly, I refuse to visit May to October. And with that in mind, I booked a nonstop flight to 70 degree weather at the end of November. I spent a sunny couple of days on my favorite Phoenix mountain before my friend Laura, who now calls a tiny Arizona copper mining town her home, met me for a weekend of wandering the red mountains of Sedona. We spent a full two days exploring trails that wind through forests of short Junipers and tall Ponderosa Pines, past whole thickets of Prickly Pears, over and up the smooth red sandstone formations. Our final hike was a short 1-mile out-and-back trail at Cathedral Rock—a poetic celebration of the first day of Advent to spend it marveling over nature’s very own cathedral. The hike itself was mostly on layers of smooth red sandstone, the trail sometimes ascending gradually up the stone’s gradient, at other times requiring steps up that practically forced my hamstrings into a near-split given my short stature. There were several people at the start of the hike until we reached an arduous wall of rock that stood at a 45-degree angle, the trail scrambling its way up through a crevice between two boulders for a good 40 ft. stretch. Though it wasn’t a climb that could lead to your ultimate demise through a great cliffside fall, it was a mental challenge to people prone to fear—hello, nice to meet you, that is me. For this reason, several people turned around, though many hikers—including dogs the size of my foot—carried on, climbing easily up the trail and disappearing over the ledge in less than a minute. Laura went first, fearlessly scrambling up the crevice. I put my first foot up, my other foot stuck to the ground like a picnic table that’s been anchored down so no one will steal it. I was paralyzed. Fear would not allow me to take that first step, to heave myself up from the safety of the ground to a crevice that could not guarantee sure footing. So Laura turned around and offered me her hand. I took it, and I heaved myself up that first step. It wasn’t necessarily that I couldn’t pull myself up by my own strength, it’s that Fear kept me immovable. That’s one of Fear’s greatest skills: keeping you stuck in one place, unable to move forward. But having Laura’s hand for support gave me courage to take that first step, and then the next, and the next, until I had the confidence to spider crawl my way up the trail’s boulder crevice on my own. It’s easier to push Fear aside, to send him to his room for a time out, when there is someone willing to reach out their hand as you take the risk to let go of your sure footing and step up into something greater. My twenties have been a crash course in realizing our deep need for one another. Life is hard, even harder when we’re hangry and traffic is at a standstill because two lanes of the interstate are closed for construction, the hardest when we’re presented with very real grief and struggle, as will happen with everyone. Moving through life can be awfully scary—I mean, have you checked the news on Twitter lately?—but we were always meant to move through it with one another, accepting the hand that will help pull you up into something greater, and offering this same support to others you encounter on the trail. We all know how a hiking story ends, and this one was no different: the views from the top were glory—in all directions, cathedrals of red rock towering above the Verde Valley, pointing up to the blue sea skies. In Sedona, we only hiked, choosing to eat in at our Airbnb rather than spend money at restaurants out. So I can only recommend hikes to you! Our first Sedona hike was the Devil’s Bridge Trail, a moderate 1.8 mile roundtrip out-and-back trail from the Devil’s Bridge trailhead, moderate only because it requires climbing up a natural staircase most of the way, but certainly not a challenge in the hiking sense of the word—aka I didn’t feel like I was about to fall off a cliff and die at any point of the hike. 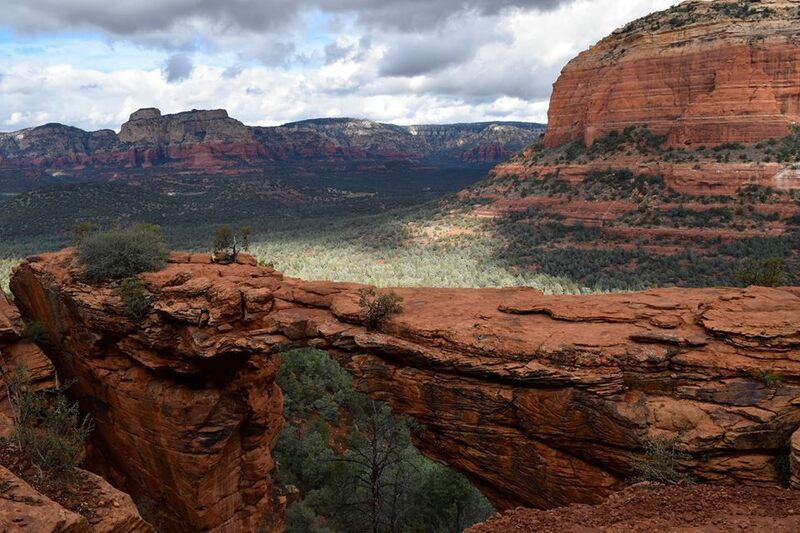 The Devil’s Bridge hike is beautiful the entire way up, with stunning views looking out over the valley from the top, with the chance to walk out on the bridge itself—a natural sandstone arch. While the views are beautiful, the hike was crowded, with everyone waiting in line to get a photo out on the arch. You can drive down a dirt road with a high clearance vehicle to reach the Devil’s Bridge trailhead parking lot, but we instead parked at the paved Dry Creek Road trailhead and took the beautiful Chuck Wagon Trail, which added a couple of miles of walking to the Devil’s Bridge trailhead. However, this part of the Chuck Wagon Trail was incredible, a welcome walk of solitude in the verdant valley, walled in by gleaming red rock, before reaching the noise of Devil’s Bridge. I would absolutely recommend making this a part of your Devil’s Bridge hike, especially if you want to enjoy nature without loud conversation or people playing music sans headphones while they hike (ugh). Later that afternoon, we hiked the Little Horse Trail, another trail that ended with sit-for-a-while-and-soak-it-in red rock vista views. This trail is an easy 3 mile roundtrip out-and-back trail that takes you through quiet forests and up to an exposed sandstone ridge. The trail itself wasn’t busy other than the occasional mountain biker, but at the top we were surprised to see a pink jeep pull up from over the ridge and let out a load of loud, fanny-pack wearing tourists. This continued in 10 minute intervals for the entire time we were up there, a Debbie Downer when it came to my expectations of sitting in quiet at Chicken Point, where the trail ends. Alas, not so. The Cathedral Rock Trail is short in mileage—just around 1.5 miles roundtrip—but requires plenty of effort to make it to the top, which is why it’s classified as strenuous. The majority of the trail is up the curving sandstone butte of Cathedral Rock, which means you’ll use your hands for much of it, including the aforementioned scary rock crevice that you’ll be required to navigate with hands and feet. Because the trail can get a little dicey for those afraid of heights, that means that the top—a rest on a saddle’s ledge between two looming towers with “wow is this really real? !” views all around—isn’t overrun with people snapping pics on their phone without ever stopping to enjoy the view. Laura and I were able to stop here for a bit and bask in the blue skies with no pink jeep in sight. The closest to rock climbing I’ll get. All these trail end vistas make lovely places for a light snack, so bring along something to enjoy at the top! Proper hiking shoes will serve you well climbing smooth sandstone. Devil’s Bridge and Little Horse Trail aren’t great for those seeking top-of-the-mountain solitude, but they will treat you to “is this heaven or...?” views. There are parking fees at the trailhead lots which will cover your day of hikes in Sedona. The Devil’s Bridge & Cathedral Rock lots are small and fill quickly, so get there early, especially if it is a weekend. I spent several days in Phoenix prior to Laura arriving, and then she and I also enjoyed some Phoenix food & hiking, so these places deserve a quick mention. Many of these restaurants already received accolades in my Phoenix post from last January: Yupha’s Thai Kitchen, Joyride Tacos, and Federal Pizza. They deserve all the shout outs they can get, because they are truly delicious and my top go-tos any time I return to Phoenix (which means I will 100% be eating at all these places when I am in Phoenix again next week). Azukar Coffee and Cartel Coffee are two coffee shops that I visited. Azukar is close to South Mountain, the area where I was staying, featuring a fireplace and funky wall art, two things that I love about a good coffee shop. The mocha had the spicy kick of Mexican chocolate—I’m not a huge fan of that, but if you are, then you’d dig Azukar’s mocha. Cartel is a coffee shop placed unceremoniously in a strip mall, but featuring delicious mochas in a “coffee lab” vibe. With that said, in my two visits to this place over the years, it has always been crowded, with seating difficult to find. Zinburger was a new restaurant that I tried with Laura. We stopped for dinner at the one in the Camelback neighborhood, and I was delighted to enjoy the most delicious gluten-free bun that I’ve had to date. 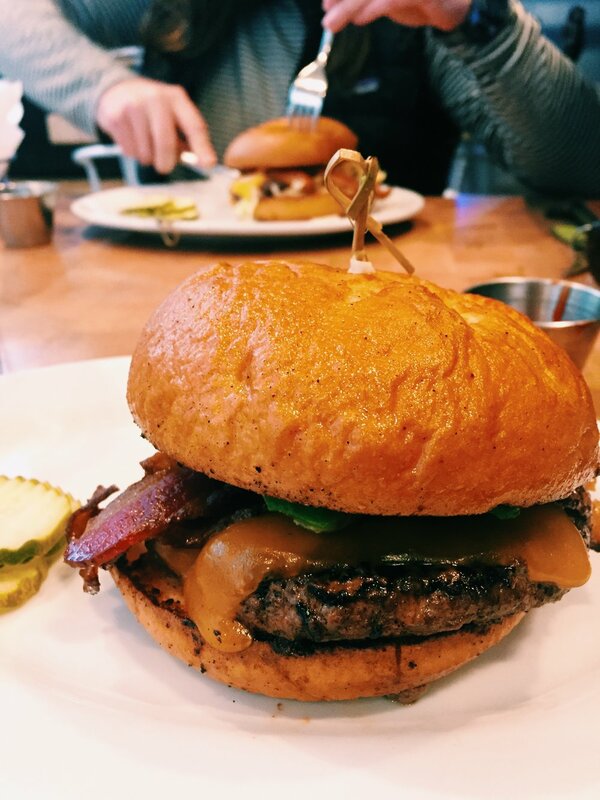 For that reason alone, Zinburger easily won over my affections. And as I’ve mentioned before, South Mountain is my place, and where I spend the majority of my time when I’m alone in Phoenix. It has several miles of hikes and despite being in the middle of the city, you’ll feel like you’re in the middle of a cactus-clad desert wilderness. Get up to $55 off your first stay with Airbnb using my referral code! 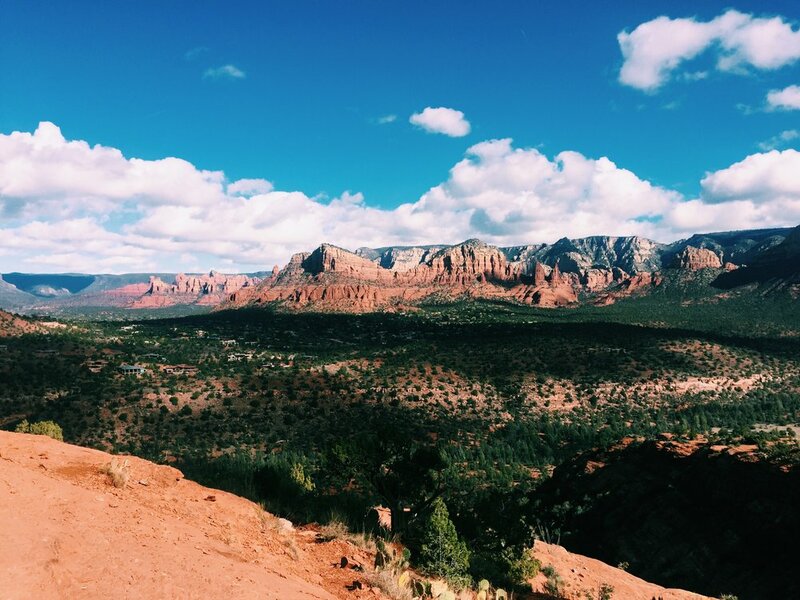 We stayed in an Airbnb both in Phoenix and Sedona and loved them both—they are often more affordable than a hotel, and make the dream of living like a local a reality!